"At Toner Machining Technologies (TMT) workholding fixture design and manufacturing is fundamental to our precision machining business," said Jim Toner, of TMT. "We specialize in workholding fixtures for vertical and horizontal machining centers as well as other conventional machine tools. We also build fixtures for precision rotary trunnion applications where indexing and alignment accuracy is essential." TMT utilizes SolidWorks (3D modeling design software), AutoCAD and Cosmosworks (finite element analysis software to determine and reduce high stress concentrations areas). TMT has developed a structured design process that includes customer input in all phases. A design checklist is utilized to insure that key features are always considered prior to the fixture design. When the initial concept is complete a customer review is held to verify that locating points and specific process needs are met. Customers approve the final design and TMT personnel review all component details before prints are released to the shop. Upon project completion a detailed manual consisting of finalized drawings, operation and maintenance instructions, spare parts listings, pneumatic and electrical schematics, and final inspection results is compiled. In addition, the book includes a CD of listed information and digital photos. "In our designs we offer internal plumbing of hydraulic components and custom guarding in order to reduce chip build-up and we also provide hydraulic filters on all fixtures as a standard feature," said Toner. "In addition, we interface hydraulic inputs from an overhead rotary, the machine pallet, or stand-alone pump source. We provide part sensing and part presence capabilities as well." TMT maintains equipment and staffing to manufacture precise fixture components. All parts are inspected in a controlled quality lab using precision inspection equipment including a Zeiss CMM. "A major key to our fixture building success is our loyal customer base," said Toner. "It's a great feeling to work with customers on repeat projects. We have a great group of key customers such as Arvin Meritor, Eaton, Dana, Getrag, Sypris, Caterpillar, Haldex, Chiron, Stanadyne and GE." TMT just completed its second project with Beckman Precision, the local Makino distributor, for the Caterpillar Corporation. The project consisted of two self-centering hydraulic fixtures for a Makino a88 HMC with a stand-alone hydraulic part locator. According to TMT fixture designer, Brandon Hensley, each fixture weighs 1,500 pounds and stands 1,200mm high. The fixtures were internally plumbed to reduce chip traps and fitted with hydraulic filters to simplify scheduled maintenance. The self-centering feature was accomplished by a custom made rack and pinion arrangement on hardened ways, and slides and independent centering and clamping cylinders were utilized to maximize process repeatability. Clamping cylinders were individually checked to minimize forced motion and hydraulic float. The hydraulic source is a customized Makino overhead CPH unit that provides constant hydraulic pressure during all machine operations. 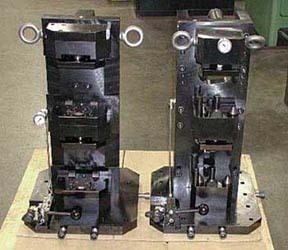 In late 2003, TMT provided Beckman Precision with four similar fixtures to manufacture a smaller range of products.